Is your dog thriving, or merely surviving? Holistic (raw, whole foods) nutrition does more than fill Fido's food hole. It supports the whole dog, tip to tail. I’ve done it only once before. So when my initial efforts to treat Evelyn’s wart failed, I thought maybe I was crazy, or maybe my previous success was just a fluke. BUT NO! IT WAS NOT A FLUKE! Let me back up here a minute. Evelyn had a pretty big wart on the back left paw, far left toe, under the pad, for months. It caused her to limp slightly. Last year, I had succeeded in ridding Pearl’s paw of a wart that emerged following a splinter extraction by using the inside of a banana peel. For Evelyn, I treated hers several times by the same method — scraping out some of the inside of a banana peel, applying it directly on the wart, and wrapping her foot in self-sticking gauze. Voila! Banana patch! This time, though, nothing happened. No change. Zip. Nada. Nothing. After all we’ve been through, wart removal rested on the back burner for a long time. Other matters were much higher on the priority list. So I gave up for a while until we could deal with more pressing concerns. Once we got the incessant scratching under control, I decided to tackle the wart again. I was determined to get rid of it because the alternatives included letting it stay and continue to bother her, or cutting it off. And cutting in/on/around a paw pad is bad news in my book, even with a laser. Finally, with multiple failed attempts under my belt, I discovered the error of my ways: I wasn’t getting deep enough into the banana peel to get to the good stuff. You really have to get into the deeper fibers of the interior of the peel, beyond the top couple of layers that sit between peel and banana. The fiber in that inside layer is a different, sort of juicy consistency than the banana itself or even those weird long thread things that sometimes stick on the banana after you peel it open. It’s almost like getting into the gel of an aloe plant, but it’s nowhere near that thick. I’ve done it twice now, on two different dogs. So, before you go running to the vet for surgical wart removal, try a banana patch. 2016 has started off fast! I’ve not had time to blog, and just discovered a stack of posts half-drafted that are waiting for my attention. They’ll have to wait. This is big news. After several months of multiple failed attempts to consult with Dr. Natalie to help get Evelyn healthy enough to withstand her heartworm treatment, I finally gave up. You can only beg someone to take your money so many times, right? My brother-in-law’s brother suggested I try Dr. Mary Battistella at Kowaliga Whole Health Pet Care in Eclectic, Alabama. (Thanks Andrew!) I called on Monday of last week, and immediately got in to see her the following afternoon. Granted, it was a 2-hour drive south, but in the end…Totally. Worth it. Since Evelyn’s arrival on Labor Day 2015, she has had a significant skin problem. The skin along her back was rough and discolored, the hair was patchy, and she scratched at it constantly. The base of her tail is completely smooth with no hair at all. This coat is a complete wreck. The base of her tail is totally hairless. This pic is from her first week with me, and things really haven’t improved. I didn’t worry too much at first because she had so many other things going on — vastly malnourished and underweight, heartworm positive, mast cell tumors, and various other imbalances — I focused on stabilizing her nutrition, tumor removal, and heartworm eradication. All along the way, we tried anti-fungal spray and shampoo, antibiotics, steroids, Bendadryl, Apoquel. I’ve been massaging coconut oil into her skin at night for months, to no avail. Nothing worked. Everything in red is a trigger for Evelyn. The good news is that only the circled items are the things she’s had in her diet: Chicken, chicken eggs, carrots, sweet potato, peaches, dairy milk, cheese, cottage cheese, yogurt. The bad news is that I fed her a ton of cottage cheese back in November and December when I was desperate to get weight on her so that she could have her second heartworm shot. I also fed carrots and sweet potatoes regularly. Raw chicken is in the rotation. She gets a raw egg in her breakfast smoothie. Every. Day. Poor baby! No wonder she was scratching non-stop! The better news is that there is SO much on that list she is NOT allergic to. And now I know what to avoid. We have a lot to work with here and I am so grateful to Dr. Battistella. Dr. B also gave us a B-12 vitamin, wheat germ oil to apply topically, and a homeopathic tonic for skin that I give her daily. With the dietary No-No’s delineated, I am finally hopeful that we can solve this problem from the inside out, and get her health on the right track once and for all. First things first. Shout out to my sister, Leah, on her birthday. I’ve convinced my dad and some of my friends to switch to raw. But nobody has the time to do what I do every weekend — prepare dog meals for the week ahead. And sometimes, when I travel, my grand weekend jaunts to farmer’s market and my Saturdays spent chopping, cooking, freezing, and prepping for the week get pushed aside. 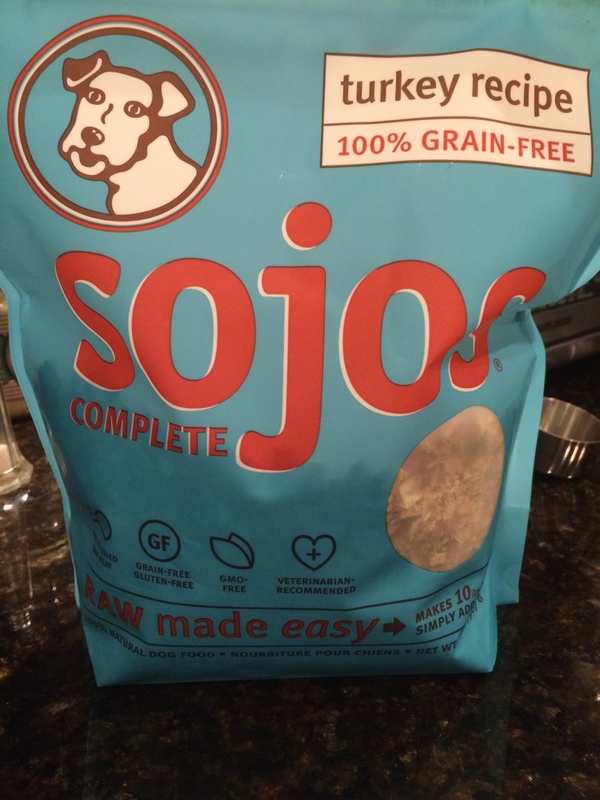 In those instances, Sojos Complete freeze dried raw food comes to my rescue. And the affordable convenience of Sojos has enabled my friends and family to feed a raw diet to their pups as well. 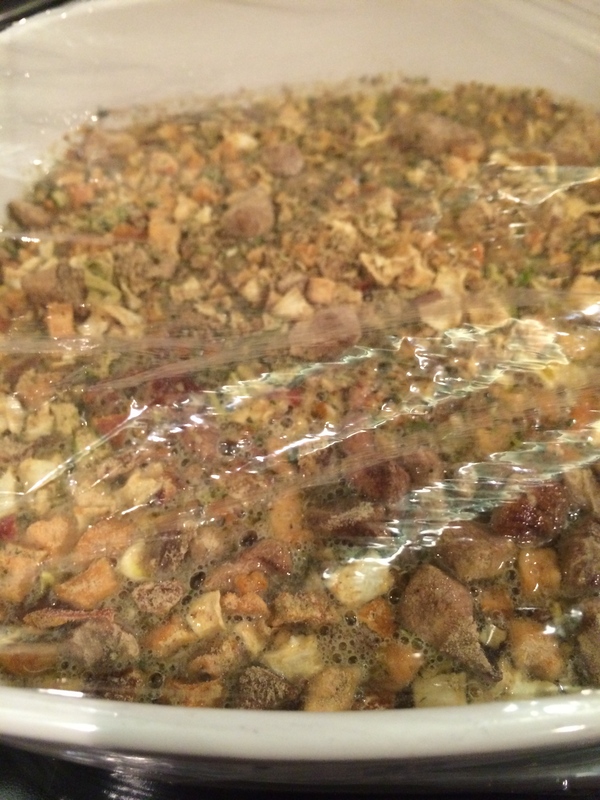 2 pounds of dry makes 10 pounds of rehydrated food. The price works out to less than $2 per meal for the Pugs. My friends at The Whole Dog Market in Homewood began to carry Sojos this spring, and I’m so glad. So many of the prepared raw foods are so cost prohibitive. Sojos is not. And it comes in several varieties, including Turkey, Lamb, and Beef. It also comes in a form that you can add your own fresh, raw meat to. 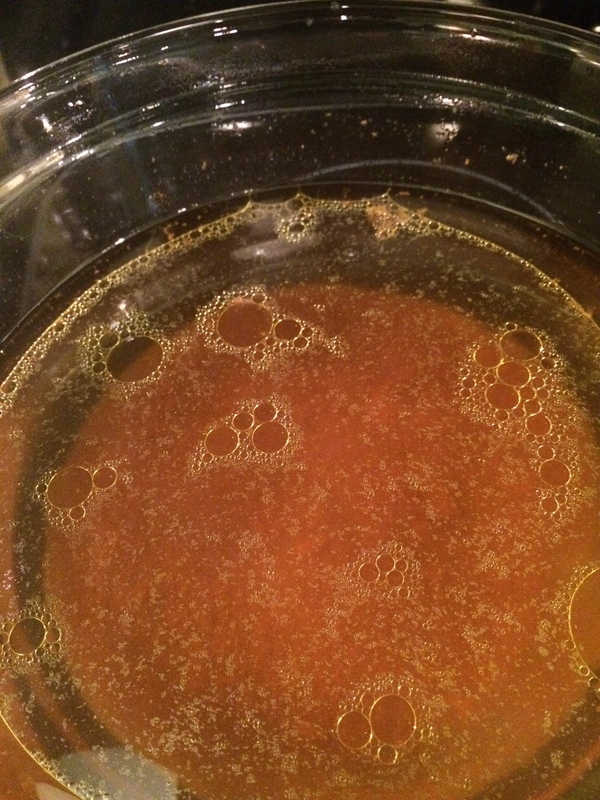 I use homemade bone broth instead of water to rehydrate. Rehydrating Sojos in a glass container covered with plastic wrap. Looks like turkey stuffing. Pearl and Truman love it. I still prefer to make their food myself because that way I control what’s in it, particularly when we’re experiencing times when they need more or less of certain ingredients to address particular issues. But, to add variety, ensure balance, and in times when I just don’t have the time, this is a fantastic option. Reads like a healthy grocery list. You don’t eat this well, do you? 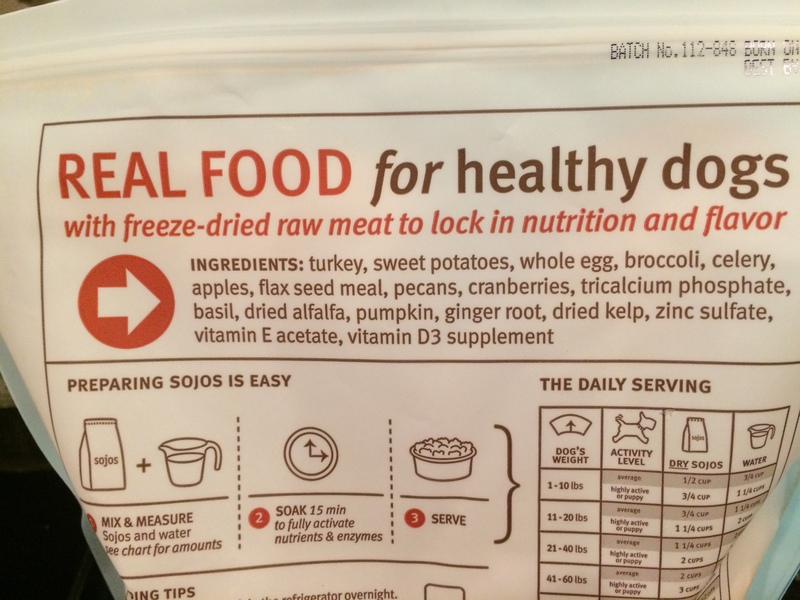 When I first started feeding raw, I fell for FreshPet in the refrigerator at the grocery store because I needed a convenient option for times when I was away. But I have since learned that it is heat pasteurized, and frankly, I just don’t trust the quality of any dog food product on the shelves at the grocery store anymore. I am much more confident in the quality nutrition in Sojos. 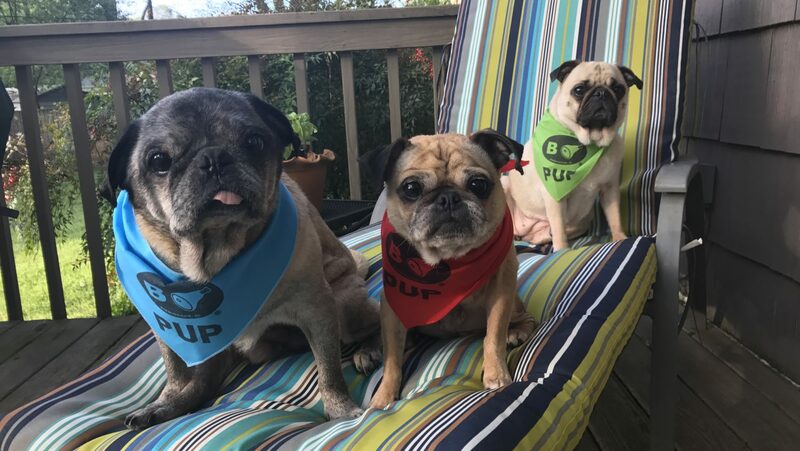 And, my great friends at Just Happy Hounds are happy to feed Sojos to Pearl and Truman when they keep them when I travel. They treat ’em like I do! In our quest to reduce sugar, and thereby reduce yeast and trim the waistline, I worked on a few smoothie options that contained more veg and less fruit. These options have been working. Pearl’s urine is clear, that potent smell is now gone, and she’s lost over half a pound in 2 weeks! A pinch of sea salt because the body needs salt to function properly, and they’re eating whole, unprocessed food that contains no salt. So, we have to add it back in. Raw honey for its antimicrobial, antibacterial, and homeopathic treatment of environmental pollen allergies. For a more detailed account of all things marvelous about honey in your dog’s diet, read this. 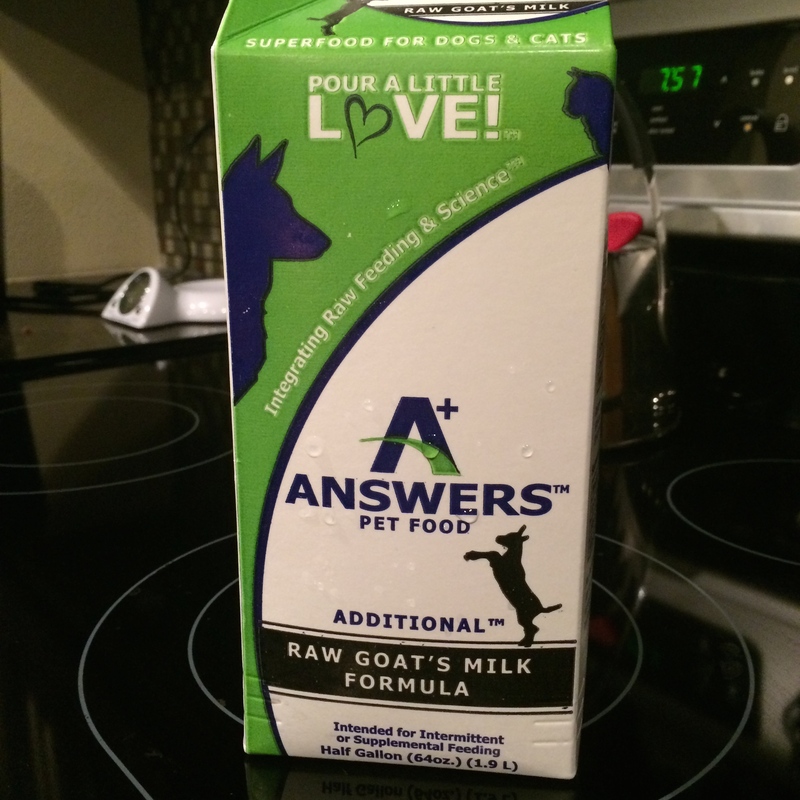 Raw, fermented goat’s milk for the protein, probiotics, and natural antihistamine. It comes out clumpy, which freaked me out until I read on the carton that it contains curds. Shout out to Little Miss Muffet, yo! 1 clove of freshly minced garlic. I’ve discussed it before. It’s on every veterinarian’s list of what not to feed your dog. This article in Dogs Naturally Magazine explains why that is and refutes it. In such a small quantity, it’s good for the gut. It’s anti-fungal, antibiotic, antiviral, and boosts immune health. The other thing I’m adding is blueberries while they’re in season. Blueberries are such great antioxidants, and good for the smooth muscles of internal organs. A small handful doesn’t bring in too much sugar. These two recipes below include several “cooling” foods that also support the liver. Note: The avocado makes a thick and creamy smoothie. You may want to add more water to make it thinner. These have been super easy and very popular. Of course, my dogs will eat just about anything I put before them, but they’ve not turned a nose up even once. Plus, I really feel good about feeding these things to them. At night, they of course get meat protein, and I don’t have to worry about balance because they’re getting these wonderful greens to start their day. I also feel confident that we’ve got our yeast, bladder, and liver issues on the run.